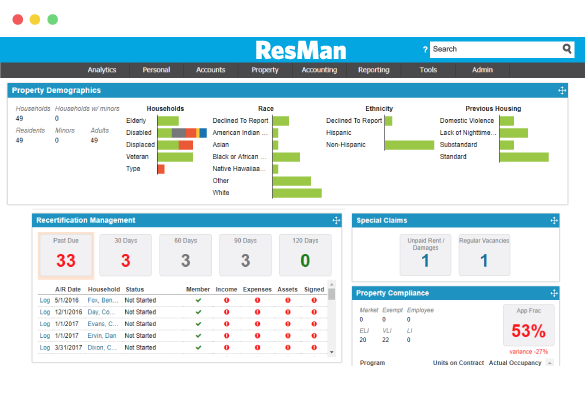 ResMan is a property management tool built for affordable and conventional multifamily operators, which provides robust operational and accounting features and solutions for the resident lifecycle. ResMan is a property management platform built by property owners and operators who saw an opportunity to provide an innovative technology solution that delivers consistent NOI growth and breathtaking resident experiences. Finally, there is a property management software that makes accounting, resident engagement, and integration easy, whether you're on-site, in the field, or at the corporate office. We invite you to Love Your Software. Pros: I like the fact that they have dedicated friendly Customer service who would be there for you by email, by chat and by phone specially when Resman is new to you and trying to learn its features. 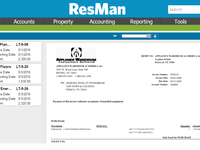 Compared to other accounting software I have used, I would most likely recommend Resman to others. I also like the fact that they take criticism and reported loopholes constructively to improve and develop their software better to be more competitive. Another this I like about Resman is they help you when you set up the books at its initial stage. Cons: Initially, I did not like the bank rec modules, but it looks like my problem with it has been addressed. I also least like the transaction categories because when you create charges, you think the category you chose would flow through the financial reports, but not all the time. It depends on how the transaction categories are being set up. If they were set up incorrectly, then your reports will not be correct and you will end up doing a journal entry to correct them and it is not efficient in a way. Garbage in, garbage out, sort of. What I would like to see is when you create charges, you should be able to choose from the chart of accounts directly, and not from the transaction categories. Overall: Every accounting software has its loopholes but the difference is how the software company make use of any loopholes reported. With Resman, they have people dedicated to improving their software and they welcome suggestions and observation. Then they don't take that lightly. They discuss it with their development team and find a solution immediately. Other software company may listen but they may not take action according to expectation. I have been using Resman for almost two years now and so far, I do not have any significant complaint yet. I give them 4 out of 5 stars. The missing one star, being the room for more improvement. Pros: Lots of features (ability to upload photos, pets info, vehicles, leases). Seems simple at first, until you begin adding data & its counter-intuitive. Does have wide variety of multiple Report choices. Nice format to send client emails, notices and statements. Cons: Very long-learning curve (even for experienced managers); sell `ease of moving into their system, but it isnt easy and doesnt have a smooth transition (& havent heard of any of our peers who did either). support isnt available in evenings (when mgrs. often need help, as apt offices are very busy during day hours). Unresponsive to recommendations. Chat (during day) is not very quick (are friendly) and has to escalate issue (which may take several days of going back & forth before issue is resolved if it can be resolved. Posting collections affects NOI and bottom line greatly (many owners/mgrs. who are doing major rehabs in class b-c-d properties no longer even list collections (which used to warn future landlords about a resident) because it affects their bottom line so negatively in Resman. There's not a way to make some GL accts options (or to have as optional or line-item info in reports as has been requested). Vendor invoices dont lay out like industry standard. Initial settlement statements input (even if done by Resman) and security deposits can mess up your system for years. Corrected posting errors in banking info cannot be hidden but show up, making scrolling post those corrected errors very long and disjointed. We have many friends in MF industry and all report difficulty & complexity of Resman, but like some of their better features. It isnt user-friendly or simple. Can have complex integration w/other partners initially or until you have kinks worked out. Overall: Liked the client format and ability to gather & share info w/clients. Liked integration with Bluemoon leases. Jeanne, thanks for your review. Our goal was to offer a single end-to-end system for operators in the field that included everything you need to manage a portfolio of assets. We knew we were on the right track, and in particular our product's workflows, resident communications, and the reliability of our data and reporting have garnered kind reviews. In the six months since you wrote this review, we have worked hard to grow and improve our customer success team, and our case management and resolution numbers are looking great these days. We know that there's always room for improvement, so we'll be rolling out new ways to learn how to use ResMan, including online training, in the coming months. We're truly grateful for your business, and please reach out for help if you need anything. Pros: ResMan is designed to save you time and make sure that your entries are correct. I love that there is more than one way to complete an action (for example, to record an invoice you can click on the Invoice link on the bottom menu, or go to invoices from the top menu), and that there are checks in place that do not allow to save a transaction unless every cell has been completed correctly. I also like how customizable the system is by allowing you to create different permissions for each user, different permissions and custom settings for each property, and different reports based on personal/company preferences. Before we switched to ResMan, we had different softwares to track the different activities pertaining to managing properties, but now everything is in one place and it is so much more convenient and time efficient. Cons: There was only one element that I did not like about ResMan and that was when every report displayed the ResMan logo in bright blue. The issue was addressed and the logo was removed within a short time. Overall: I personally love ResMan because it has allowed me to increase efficiency and accuracy. I think it has saved the company a significant amount of money because without ResMan we would have had to hire many more people to complete the tasks that now are performed by two. Pros: I love that it is so easy to navigate. I will be paying bills and need a GL Code, so instead of pulling out the list you can just put like paint in the search bar and get the Code you need. Simple and efficient I like that our background screening and rent payment site is accessible within Resman. I love the little lizard guy. I like that you can stroll over something and get an explanation of it's function, that is wonderful. Cons: I have no way to back up, so I have to pull the addresses back up while working in them. I do not like that you cannot just enter someones phone number without getting their birth date and social, it will not let you save the number without it and some people don't like providing that info when all you really need is an updated contact number. I have had issues when trying to take a roommate off the lease and creates an accounting nightmare that I have yet to be able to correct. When doing the move out reconciliations I have found that a simple mistake will create double charges. Overall: Resman is easy to use for everyday simple task and very efficient, the problem I have experienced is not being able to correct a mistake or back up when needed simply and quickly. Overall I would absolutely recommend this software to other property management companies. Pros: There are so many great features in Resman it is hard to choose, the reports are great, the integration partners are so convenient and easy to set up. The software is so easy to navigate and you have an integrated calendar in which you can add an event and tag anyone in the company. The software also has a tasks bar to add daily, weekly and monthly tasks. There are still many great features provided. Cons: The thing I like least about the software is the ledgers which could sometimes be a little tricky for personnel to understand. Overall: We have been using Resman for the past 2 years and it is an amazing software. With Resman you have easy access, and user-friendly functions. The layout of the website is great and the navigation is easily understandable. You have hyperlinks from reports to residents, invoices, and transactions that are so convienent in checking any discrepancies. The conversion process is getting so much better from our first conversion to our latest conversion it was painless and fast and the customer service was proficient. The different communication methods from texting to emailing in bulk are so convenient for Property Managers. Pros: I like how simple and easy this system is to use. Every time I have called customer service I have had my questions answered. Cons: I wish there was a way that I could text my residents. Everyone including prospects have asked me to text them for one thing or another and I cannot. Please find a way for us to change this. 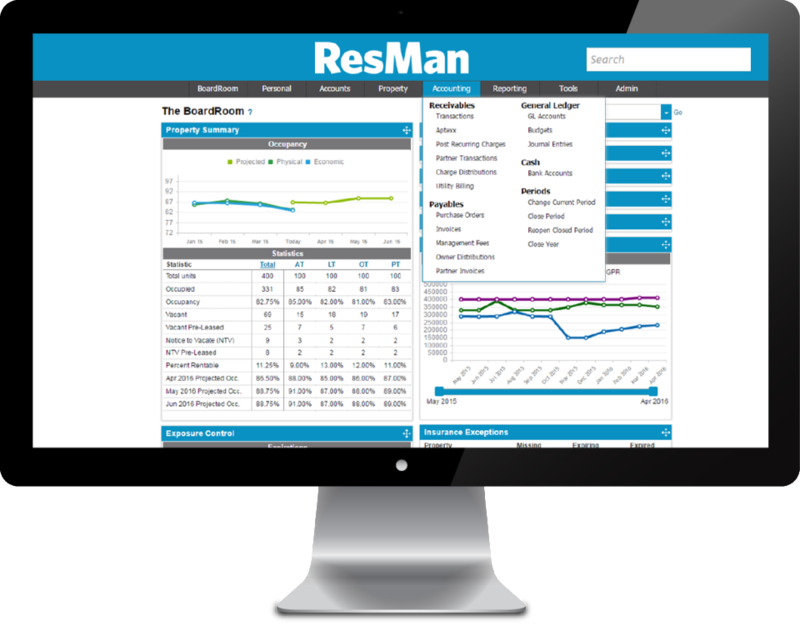 Overall: I have been using Resman for 3 years and it is easy and quick to use and learn. Another great part of our resident communication feature is that your software has a built-in communication log so that you can track who communicated, when communication was sent, and how you communicated. Pros: I am obsessed with ResMan. I am a leasing professional, who is a daily user of the program. We use this program for our property, and not only I but my team loves how user-friendly it is. We can do anything from generating leases, prospect follow-ups, bulk messages, texting residents, invoices, box reports.. you name it we can do it. Cons: That sometimes in order to gain access to certain tools, the admin must change control on their back end to give me access. BUT I don't really see that as an issue, just the only con i could find. Another tool would be the bulk messaging tool. I love to save templates like ( freeze warning, trash pick up, renewal emails, even pet reminders) and send them out as reminders on the property, and with the tool, you can send it out to their emails, and phones simultaneously. Perfect tool to reach all my residents. Yessenia, thank you so much for your review! Our team is intimate with the trials and tribulations of life in the leasing office, so you are front of mind when we build our products. Thanks so much for your business. Cheers to your success! Pros: My favorite feature of Resman is the texting option and online payments. I can easily and quickly send out text alerts to all residents about emergencies, events, etc. With most residents they respond quickly to this feature as most people have a cell phone with them at all times. It has helped me as an Assistant Property Manager to have regular contact with my clients. Cons: There is not anything I can think of that I am unhappy with at this time. Resman is very user friendly and also has training videos that you can watch if you need assistance. Overall: The main benefit of Resman for me is running a large amount of Form Letters, emails, and texts. As the Assistant Property Manager of a large community of over 500 units, Resman makes my tasks of communicating with residents much easier and less time consuming. I have used several Property Management websites in my years of experience and Resman is definitely my favorite. Pros: I love the texting option, the Bulk Sending messages and e-mails. Cons: It seems pretty easy but once you are doing pre-closing - or changing period "DATES" if not enter currently- makes it difficult without you knowing and you're trying to figure out reasons. Also, move out reconciliations when you print out a new one instead of searching through the dead files, it gives you the date as of the date you print it and it enters your name , even if its a Reconciliation from 2 years ago with another Manager. I really do not like this, it should have original Final Statement. Plus, let you reverse your mistakes so you can start over. Is like Resman makes you do what Resman thinks is best. So , it's a little annoying. ( I hope I made sense). Overall: Is good overall. But really dislike certain ways for Move out reconciliation and Pre-closing ways. Pros: First and foremost, ResMan is designed with the property's site staff in mind. 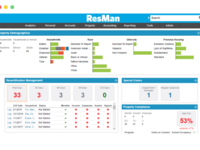 ResMan is intuitive and user-friendly. Onboarding our new team members is not nearly as difficult as before since the learning curve with ResMan is not nearly as dramatic as with other software systems. Cons: It is frustrating to use a software that can feel like it is still in beta testing at times. I understand ResMan is growing and I appreciate ResMan's commitment to improvement and development. However, as the administrator of our account and liaison between operations, accounting, and our executive team, I feel the growing pains ResMan goes through much more acutely than the majority of users. It gets old to use the phrases, "Yeah, that's a known ResMan issue," or "Yes, we've already let ResMan know and they've escalated it to the development team." Overall: Overall, ResMan has allowed us to empower our people to take a greater degree of ownership over the operation of our properties. Our initial implementation and transition to ResMan was much smoother than most software changeovers. It is for these reason that we are happy with our move to ResMan and would recommend it to other property management companies. Pros: The software is very user friendly. I love the cloud based software, and the ease of being able to access the software from a tablet and cell phone, with ease. I like that the software is able to merge with so many other sites that we use, although they can improve the ease of the integrations going both in and out of the software. Cons: The customer support help desk is lacking training and professionalism. The level one support system has issues solving any customer support concerns, and refuse to pass it to someone more experienced to handle it. In addition, the way they treat the customers is typically rude, and unprofessional. The reports aren't completely up to par with other software competitors customizable views/preferences. Pros: I have used Yardi, Appfolio, Quickbooks and ResMan throughout my career. ResMan by far is the easiest to manipulate. It's a new product, and I like that the owners are willing to listen to suggestions and improvements. It has met my needs for everything property management has to offer. Cons: Just small little items. For instance, on the lease expiration report, why would I ever want to mark former residents? It's set to default. Overall: On Facebook there is a group called Apartment Management and Maintenance Support Group. Every month there is someone asking which software package we recommend. I always throw out ResMan. It's inexpensive, but still a quality product. I've also recommended it to my personal HOA, where I sit on the board. I really believe in ResMan, its support, its reports, and the overall product. Easy to use and great for affordable properties! Comments: We are a small property management company, managing roughly 200 affordable units and 16 market rate units. We manage both multi-family and single-family homes. We went "live" with ResMan about two months ago and couldn't be happier. Before we had been using Quickbooks and spreadsheets, lots of spreadsheets, and it wasn't efficient for the size of our business or to be able to grow our business. With the majority of our units being affordable, tax-credit units we knew we needed a property management system we could rely on and that would allow for the specific reporting and tracking that comes along with managing tax-credit properties. ResMan has exceeded all of our expectations when it comes to the affordable side. The implementation process went as smooth as it could have gone. And now that we have been actively using ResMan for two months, we are so happy with our decision. ResMan has allowed us to focus on other tasks that come with running a property management company that had been ignored due to the time it use to take us to record everything and run all of our necessary reports. Pros: We love all the different kinds of reports ResMan offers and the ability to click into the detail from the reports. It is also so easy to get around in ResMan and being able to use the search bar within ResMan. Wonderful for affordable/ tax-credit properties. Being able to chat/message with the support desk or have someone call you within hours and explain and walk-through fixing any issue has been so helpful. Cons: When posting recurring charges, you have to post everyone with a recurring charge, there is no option to take anyone out. Pros: This system makes it easy to track all relations with your tenants- between basic communication, maintenance requests, payments, pets, etc. Cons: This system does not function well with corporate accounts- leases that are under a company name as it is more set up for residential/individual leases. You can still make corporate leases work but the processing has to done outside of resman. Keri, we're so happy that ResMan makes you more efficient and effective. I will take your feedback about corporate accounts to our innovations team to explore what we can do there. Cheers! Pros: While ResMan was intended for use with multifamily properties, our company uses it for an assisted living community. The functionality is flexible enough to be able to accommodate our needs. It would be more helpful if we were able to customize our invoices, mainly just reformatting to fit a windowed envelope better. The maintenance function is particularly helpful as it allows our maintenance department to stay on task. I like the fact that the transaction categories can be individualized for our business type, this makes things more accommodating for our business type. Cons: For me, the least user friendly feature is trying to figure out how to turn back on the draft feature once it has been turned off due to an overdraft. This is not very apparent as to how to do this. Pros: It is somewhat easy to use, the dashboard is attractive and doesn't look sterile and cold like OneSite. The support team needs to be larger, but the team they have definitely does their best to react quickly and puts in requests for enhancements when we can not be helped. They are always friendly and upfront on what is coming and what they are trying to improve. Cons: Too much double work, for instance to add lease term options you must add the property to the lease terms desired under Admin, Settings AND add the lease term under Property, Unit Type. As an Admin that the Regionals/Site Team depend on it is imperative that requests be taken care of swiftly and almost every task in ResMan requires an absorbent amount of time on the back end. Easy Lease, there is nothing easy about this.... from the set up to the use at the site level. Entarata has been my favorite with inline applications/leasing as far as ease of use and customer experience. Real Page wins over ResMan in this area as well. Overall: Overall, I think ResMan is TRYING to get in the game, but I wish it could happen a little(or a lot) quicker. Our account rep and support team are always great, they really do try their best to make all of our Property Management Softeware dreams come true. I REALLY want to love ResMan, I am hopeful that the future will show some drastic improvements! Pros: I have used several different leasing and rents programs and this is by far my favorite. Its user friendly, allows for business to continue while finalizing close out for the prior month. Dawn, thanks so much for taking the time to share your feedback. We hear you loud and clear on reports and have invested an impressive amount of man-hours in developing reporting you'll love. Stay tuned for news on that front in 2019! Best wishes to you and your team at Centra Partners. -Not having a tutorial for form letters. I learned how to make the file "Smart" to know what information to input on my own .. Overall: The experience hasn't been bad, I just wished we could submit issues and they would just get solved . It is very hard to take time to report an issue and actively answer questions when there are so many more things to do or work on. Pros: The fact that it is internet-based, meaning we do not have to install software directly on to our computers. We can access the software from any computer with an internet connection. Cons: The merge fields with Blue Moon don't quite line up with what our leases require, and we have to go in and manually change certain fields when creating a lease. Overall: We love the bi-directional text feature, and the ability to send applications to prospects online if they are unable to come into the office to fill out a paper app. Emily, thanks so much for taking the time to share you experience with ResMan. The bi-directional texting feature is a favorite feature for so many of the thousands and thousands of property managers that use it. The feedback on Blue Moon is much appreciated. We're always working on improving leasing. (Stay tuned for an exciting 2019 in that regard.) But in the short term I will ask around about that and let you know offline what I learn. Thanks for Loving Your Software. We love Melrose! Easy to use software for busy properties! Pros: I loved how easy it was to use this software and how easy it was to learn everything. They make everything user friendly which is great when your trying to learn a new software while working at a busy property. Cons: The only thing I disliked about this software was that at least a couple times a month the software would be down and you would not be able to access anything which is bad if you are completely paperless in your leasing office. Most of the time it would only take an hour, however sometimes it would be out all day which was a pain. Overall: Overall I had a great experience with ResMan and would recommend this software to anyone who is in the leasing field and especially to those who are in a busy office. Anyone can learn this software! Super easy to use! Pros: I like how easy it is to navigate and find the areas that I need. It has allowed all of our five properties work seamlessly together. I love how we are able to communicate with our tenants and have it logged into their pages. Cons: I dislike the ability to customize things based on our needs. I also dislike the new format for the Knowledge base information. I have been unable to find anything that I am looking for. Overall: By using ResMan we have been able to become more efficient in our processes, which helps us with our bottom line. ResMan has made serving our tenants a very positive experience. Pros: Super user friendly a child can do it. The tabs are so easy to identify and the navigation in the software is super easy. Cons: Search bar still doesn't recognize phone numbers. Certain reports are not available and need to be configured. Would love for more features to be added. Like pics to text messages from message bar. Instead of having to go bulk email. Separating templates by tabs instead of having to to click type. Overall: I love working on Resman I think it is super easy. Overall I think it's the easiest software I have worked with and the understanding of the information is spectacular. Pros: That you can attach documents to support any aspect of the file. You can keep track of all communication this way. It helps keep us agents and managers efficient. The tech support is very convenient by just clicking the help tab on the Boardroom. Cons: Once a resident moves out, if there are charges left over and sent to a collections account within ResMan, the ledger starts pulling portions of those charges and writing it off. Which I understand the logic behind it but it can make things confusing later on when a resident slowly pays off the balance and they want a receipt and there are a number of write-off credits showing on the ledger. Overall: This program is very user friendly and efficient. Pros: It's online and you can see all companies together in one report. Cons: Waiting way to long to resolve issues, Reports don't tie to accounting reports (e.g. prepaid), bank reconciliations don't always tie to balance sheet cash balances, transactions are batch in GL so noone knows what they are. The same vendors have different names in the GL depending on whether the transaction is an invoice or a payment making it time consuming to reconcile the AP GL to the unpaid invoice report, the balance sheet doesn't balance a lot of the time. 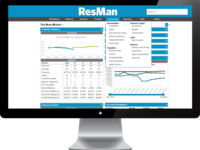 Comments: Having used ResMan for about 1 1/2 years now, I am thrilled with the company. The conversion process was relatively painless. The data is well organized. There is a learning curve - as is the case with all new software. The training was excellent and the options provided are extensive. This software can be utilized by any size property management company. Pros: All inclusive software. Permits multi-level user access. User friendly. Quick and friendly customer service. Many add on services available. Perfect for any size property management organization. All entries and/or deletions are recorded making an audit trail easy to follow. Cons: To date there are no cons. There is a bit of a learning curve. However, the user manual is easy to read and follow. Pros: This software is very user friendly and provides great reports. They provided excellent training before we started using the software. The technical support is very good. Normally you don't have to wait more than a minute or two to be connected with support on the chat feature. Cons: Occasionally technical support can not resolve your issue immediately but in most cases they get it resolved within a day - which is not a big issue. Overall: It has been a great product for our business. We are very satisfied and would highly recommend it. Pros: The back end accounting system. It is easy to enter bulk bills, scan and pay them. It offers a complete accounting solution so we no longer need to run our management software in one system and have our accounting books in a separate system. Support for ResMan is also 5 stars. With our previous software, we would wait days to hear something back about an issue we were having. Training was also great and they work to get all your information imported into their system. Cons: The search function in the system is VERY limited. ResMan says it is intuitive but really unless you are searching exact text you get nothing. That is our biggest complaint with the system. Also, the system is almost module based which we were not used to. You have to have separate contracts for background, collections, lease generation, website, etc. This leads to very high cost for the software. In addition there is no mobile app you have to log in to your cell web browser and just make it harder to use than some of the other software out there. Overall: Support is A+, Training was A+, Sofware is mixed. On the Accounting side it is an A. On the management side we have had several issues and would say it is a B-. Pros: We started out using Resman only for tracking leases, then migrated our A/P function to Resman. 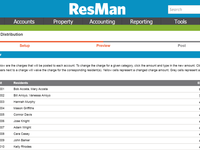 We are well pleased with the functionality of Resman for all aspects of our property management. Cons: Can slow down after entering a lot of data, but recovers after logging back in. Richard, thanks for your review. We're happy that you're satisfied with the product. But we'd much prefer if you LOVED it. We'll look into the slowness that you're experiencing and have someone reach out with anything that we discover. Pros: It's user friendly and Resman is constantly making improvements. Cons: If I had to pick a con, I would say that some of the admin settings are not as intuitive as they could be, but honestly, this is an issue in any software system because there are many options to where various settings live. Overall: The training has been phenomenal, and when we run into issues, the online/phone support is very helpful. The system is user friendly and easy to navigate through. I really love the reporting options! Overall, I would give Resman 5 stars and highly recommend it. Pros: I used to create weekly reports for my boss that listed our team's hours on each project. It was easy to select the project and dates to filter so I could export the information to Excel for the reports. It was also easy to keep track of the employee's PTO each week. Having this software allowed me to create the reports I needed within a matter of minutes. Cons: I did not have any cons while using this software. Hi Miranda. Thanks for your review! Those reports you mentioned are great and our reporting is getting even better. We have a whole team working on creating the visibility and accuracy that property managers expect. Pros: What I enjoy most about Resman is that they are very forgiving if you make mistakes . It's usually simple smooth process to fix the problem. I also like the customer service they typically answer the first time you call or call you back within the hour if they are busy. Cons: Sometimes when it's the last or first of the month , Resman runs very slow. Overall: I have been working with Resman for 2 years now and so far it has been my favorite program to use from my 5 years of working in the apartment industry. Pros: I like that Resman works well with offices that run multiple properties. It is easy to move from one property to the next and to move resident between properties. It also has a good selection of reports. Cons: Resman does not handle many of the affordable property tasks very well. Doing recerts and renewals is very confusing and is not working the way it should. They don't seem to have a good grasp on the Affordable Housing needs. They are working to correct these, but it is a slow process. Overall: I am very frustrated with the Affordable side of Resman. It takes a long time to get them to correct issues and often they do not get done. Some of their support staff are exceptional and others have no clue. Thank you for sharing your thoughts. As you know, we have grown from a small startup with almost no resources. Oftentimes, rapid growth comes with growing pains like the ones you mentioned. Over the past 9 months, we have made substantial investments in our affordable edition. Expect to see those improvements rolled out over the next 3 months. We worked with one of the largest providers of affordable housing to make the best available product and we're wrapping up that work now. Furthermore, our growth has required additional staff for the customer success team and we have high expectations. My hope is that you're experiencing the tremendous team we have now, as well as those who are still getting up to speed. I'm happy to connect offline and help however I can. Expect one of our customer success leaders to reach out soon. Thanks for choosing (and sticking with) ResMan. Pros: User friendly, good report selection and easy access to customer support. Cons: Sometimes slow in printing reports and downloading invoices. Thanks for the review, Kim! We'll look into the slowness that you're experiencing. Because of how our system is designed (specifically the re-calculations that happen when prior periods are re-opened and adjusted), there is some pretty heavy duty computer processing involved. That might be the source of the slowness. We'll let you know if we discover anything. Cons: Account Alert pop up- There is no account alert pop up available so if we have notes about a certain account and a temp or personnel from another office is trying to assist a resident they do not have a way to discern any type of situation that may be pending. Pros: I love the ease of it. Before using Resman everthing we did was tracked in spreadsheets. It's so nice to have everything you need in one place and not having to constantly pull tenant folders. Overall: Overall I'm happy with my experience. There are some extremely frustrating moments but the good definitely outweighs the bad for me. Pros: The best feature I love about this software is the search bar. You can look up whatever you need from that one tool. Cons: I must say I have used a few property management software and this by far is my favorite. Jeffrey, thanks for the thumbs up! We're so happy that you're satisfied with your software experience so far. Please keep in touch and let us know what we can do to help you be even more successful moving forward! Pros: What I liked most was the sense of accomplishment when I see everything that I have entered integrated. Cons: I don't like that there are several ways to do each task so learning most of this software was quite hard. I felt a great deal of frustration and began to wonder why it took me so long to catch on. Broke my confidence a bit. Overall: With my former company we had to do the monthly reports by hand, on paper, and had to make all that balance. Now I just enter everything and Resman puts it all together for my boss. I also really like that I don't have to keep as much filing in the office since I can look up anything on Resman. Pros: Not too hard to navigate, but if I ever get stuck, I can usually get someone on the phone pretty quick. I manage three properties, and it's fairly seamless jumping from one to another. I really wish they had an easy to use app for the phone, but we just figured out they have a decent enough mobile site, so we've now set up our maint. man with that for doing our work orders. Cons: There is a chat tab on the left side of the screen, in red that says HELP... but clicking on that is useless. No one ever responds. I really wish they had an easy to use app for the phone, but we just figured out they have a decent enough mobile site, so we've now set up our maint. man with that for doing our work orders. Pros: We have been lucky to work with ResMan for 4+ years. As we have grown our business, they have been excellent strategic partners and made training for our staff simple! Cons: We have not had any complaints or issues that have not been resolved immediately! Overall: We were struggling with management tracking and ResMan stepped in with a clear, concise software that improved our structure. It has been great as we have developed as a company! Pros: Resman is the best , can text ,email residents . Cons: Resman sometimes stops working for technical issues. Overall: Resman makes my work less complicated. Bibiana, thanks so much for taking the time to review. 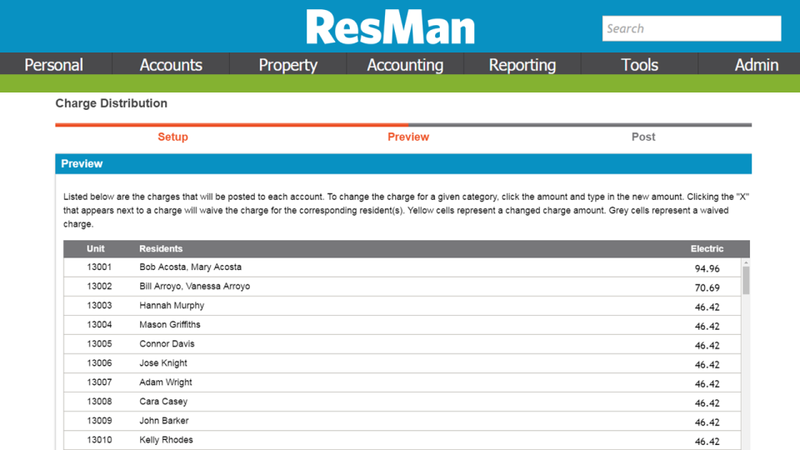 So many people around multifamily have told us that their days are easier on the ResMan platform. We're always working on uptime and we're seeing a great "triple 9s" availability but please reach out if you experience an issue. Overall: Great! Technical support is awful though- very hard to get a hold of and get educated answers. The integration team could use significant improvements as well. Difficult process when utilizing add-on vendors ie; AMS, Aptexx. Pros: The software is very user friendly. I have used 4 other software systems in this industry and have really found it to be one of the better ones. The customer service level is at 1000! You can chat immediately if you have a question or even calling its usually right away you get to speak to someone. They are always making updates to better their software too. Cons: This is not so much a con for the Resman software but more so with the partners they are associated with. We have just constantly had issues with them. Pros: The ease of use and everything you need to manage a property is in 1 system! Cons: I wish you could integrate photos and other images into the email blast functionality. Email only supports text, or images must be attachments. Overall: The sharing of knowledge is vastly sped up with an integrated system like ResMan. Owners, property managers, maintenance staff have all the data they need in an easy to use interface. Pros: The software is user friendly!!!!!!!!!! Cons: Nothing, the software is so simple to use, you can train yourself! Overall: I love using Resman, its the most simple and effective software I have used thus far. Pam, thanks so much for the positive review! Our original vision for the platform was to make property managers as effective as possible while fitting their daily lives. We're glad you love your software! Cons: None abusolutly none I actually brag about how wonderful Resman is. Pros: It is user friendly and easy to navigate. Cons: That you are limited on the amount of characters for texting. Wish the calendar would sync with other PMS. Wish that the text feature would allow photos. Wish that you were able to flag accounts for certain issues and that Resman would allow you. Overall: Over all the software serves its purpose and can use some additional added features. Pros: I like the simplicity and the functionality that is already there. Cons: Support is not always responding on time. The issue that need to be fixed has been lingering for ever. Never got a satisfactory response. Overall: Gives over all picture on the performance of the property. But one has to really look for it. Analytics is woefully missing from the picture. Lets say, if the electricity bill is going up more than regular range, then it can show up to take an action. or for that matter a dash board to see how the expenses are doing as a percentage month over month year over year and so forth. Pros: Easy to use and adjustments to fit the needs of each business. Cons: Reversals are a little sensitive in regards to the GL - but there are changes being made currently. As it is - one would need a record of posting transactions and their reversals anyway to make everything accountable, of course, but this is where user knowledge on HOW to record transactions is key. Overall: Overall accountability, which is the name if the game. 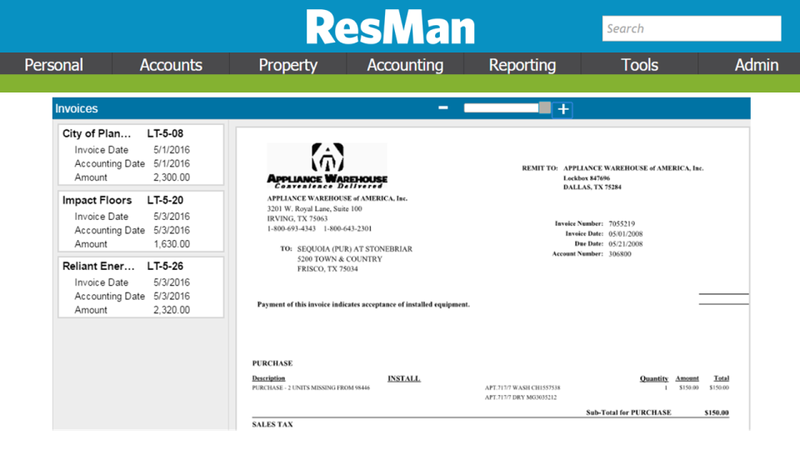 From Purchase Orders, to Invoicing, to Reports - Resman helps keep it all recorded from rental income to vendor aging reports. Pros: This is a cost effective way to manage a property. Cons: No way to download accounting to QuickBooks to handle accounting after selling a property. Needs instructions for Custom Reports. Customer service is very nice, but getting an answer is hit or miss and I often call other ResMan users because the customer service reps couldn't answer my question.